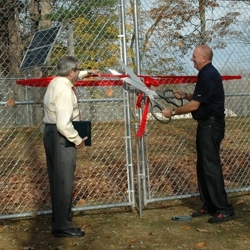 A ribbon cutting ceremony was held this morning marking the official completion of a $600,000 water storage tank to serve the water and fire demands for the Newfields Water and Sewer District in Newfields, New Hampshire. The project is being funded through the NHDES State Revolving Loan Fund. Hoyle, Tanner designed the new, replacement water storage tank at the site of the existing tank. The new tank is a glass-lined, steel tank 22 feet in diameter and 83 feet high. The project included “green” components including solar power to the site for radio telemetry and a passive Tideflex mixing system to enhance water quality. The new tank was built prior to the demolition of the 1954 existing steel tank onsite in order to keep the water system active throughout the duration of the project. The site work required a new 10 “ ductile iron water line into the tank and appurtenant valves, some grading, a security fence and driveway repair for the abutters. The project was completed on time and within the allocated budget.